Home Security SharePoint SharePoint 2010 SharePoint 2013 How to Get SharePoint Farm Account? SharePoint Farm Account manages the farm services. It runs SharePoint timer service, Used in application pool identity for Central Administration site and in database access. Typically configured at the time you run PSconfig wizard. In the First Dropdown, Select "Farm Account"
You'll find your SharePoint Farm Account listed automatically in the second dropdown. In my case, it is "Crescent\SPAdmin"
This gets farm account in SharePoint. Pick "SharePoint Timer Services" >> You'll find the Farm account under "Log on as" column. Run this PowerShell script to get farm account. You can also retrieve SharePoint Farm account from Central Administration's App Pool credentials. 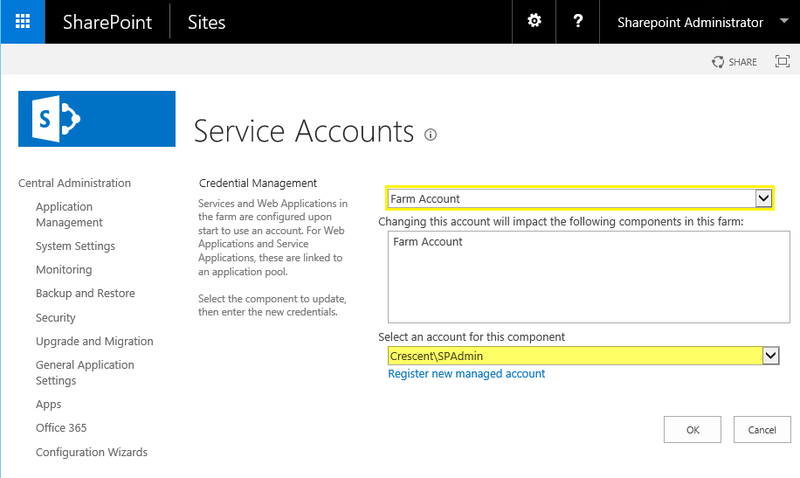 Here is my another article: How to get SharePoint Farm account credentials?